The “G” stands for George W. Cole who is credited with the invention of Three-In-One Oil. Together, with J. Noah H. Slee, they developed and marketed this one single mixture to accomplish three things with respect to the maintenance of a bicycle, namely, a rust preventative, lubricant and cleaner. 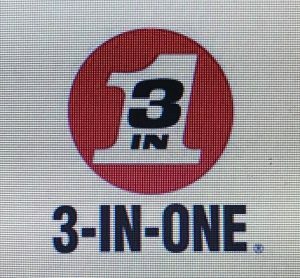 Hence the name “Three-In-One.” Some of their advertisements also stated that the product is a blend of three oils, animal, mineral and vegetable, which may also have contributed to its name. According to a story in the Staunton (Va.) Daily Leader entitled “Industry and Commerce” published on May 23, 1908, the business of G.W. Cole & Company was established in 1894 and incorporated in 1899. A September 16, 1966 story entitled: Three-In-One Oil Birth Traced to Jersey Shore” outlined the early days of the business. Mr. Slee, along with George W. Cole, developed Three-In-One Oil, a household staple, now manufactured by Boyle Midway Inc., a subsidiary of American Home Products, New York. Mr. Slee and Mr.Cole, partners in G.W. Cole and Co., “conducted business in New York and West Park, Monmouth County” according to yellowed documents unearthed in the legal department of American Home last week. West Park was part of Neptune Township. 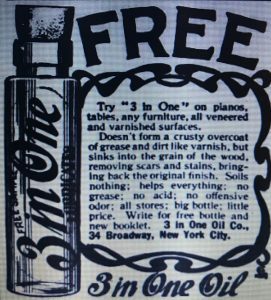 Three-In-One Oil was first sold as early as 1890 in the Shore area, and the name “Three-In-One” was first used Sept. 14, 1894. 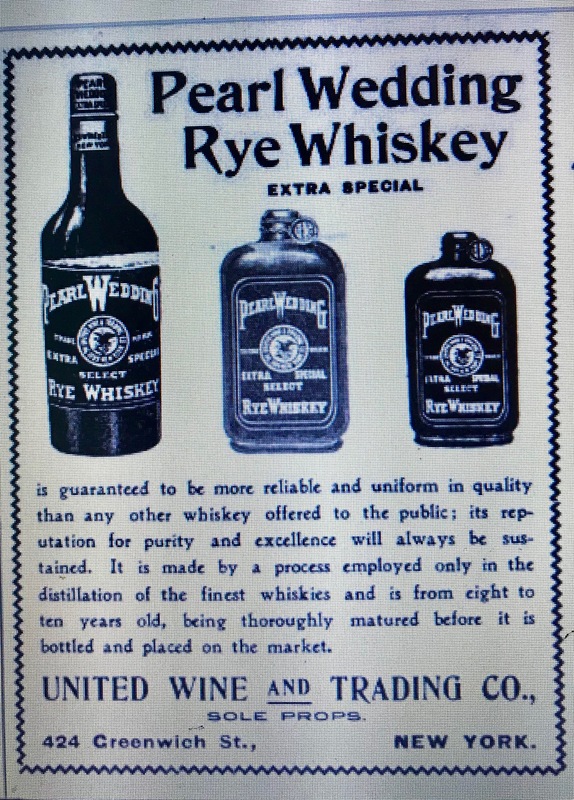 The name as a trademark was registered Oct. 17, 1905. According to the records, Mr. Slee bought out Mr. Cole sometime before 1903, but retained his former partner as a salesman at a salary of $2,400 annually. A factory was subsequently built in Rahaway (N.J.) and in May, 1903, manufacture of Three-In-One moved there from the shore. What became of G.W. 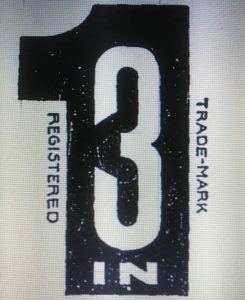 Cole & Co. appears to be somewhat of a mystery, and officials at American Home Products were at a loss to explain how the firm came to be in possession of Three-In-One. 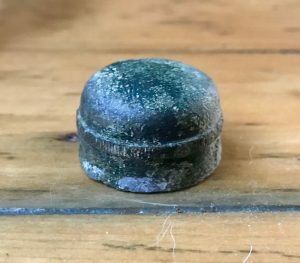 One official was willing to hazard a guess that the product had been purchased by American Home or one of it’s subsidies sometime during the 30’s. In New York, G.W. Cole & Co., was first listed in City Directories between 1896 and 1898 as “bicycles” with an address of 111 Broadway. In the 1900 NYC Copartnership and Corporation Directory the business was listed as a New Jersey corporation. At that time, the “&” in the company name was dropped, changing it to the G.W. Cole Co. George W. Cole was listed as president and J. Noah H. Slee as secretary. The business remained listed this way through 1904. According to a June 17, 1909 letter from Slee to a publication called “Printers Ink,” Cole resigned from the company in 1904. In 1906 (I don’t have access to the 1905 Directory), Slee was listed as president and Henry Hedenberg as secretary. Slee’s obituary states that he remained president of the company until 1937 when he moved to Tuscon, Arizona for his wife’s health reasons. 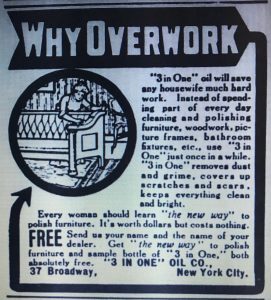 In the 1909 Copartnership and Corporation Directory the name of the company was changed again, this time to the Three-In-One Oil Company. Slee and Hedenberg remained named as president and secretary. The current Three-In-One website completes the company history and solves the mystery mentioned in the 1966 story above, as to how American Home Products came into possession of Three-In-One. The guess provided by the company official in the story wasn’t too far off. In 1933 the capital stock of the Three-In-One Oil Company was acquired by Drug Incorporated. That year, Three-In-One Oil Company was still listed in the Manhattan Telephone Book at 171 Varick Street. Drug Incorporated later dissolved, at which time the Three-In-One Oil Company became part of Sterling Products Inc. Then in 1936, A.S. Boyle Company, a subsidiary of American Home Products, purchased the brand from Sterling. The Jersey Shore factory location was apparently established in the late 1800’s in Asbury Park. The G.W. Cole Co., was listed in the 1901 Asbury Park Directory as “bicycle sundries,” with an address of Third Avenue, corner of Railroad Ave., West Park. Cole is listed individually at that address as far back as 1899. Prior to 1899 he was only listed with a residential address of 704 Fourth Avenue. According to one account, at that time, he was operating out of a shed that covered 234 square feet. In 1905 the total area was 5,250 square feet and today the floor space of the factory is more than 8,000 square feet. The building itself is vine covered and is a prominent feature on the main line of the Pennsylvania Railroad. It’s not clear when the factory shut down, but today the location appears to be a relatively new city parking garage that’s located adjacent to the railroad tracks. By 1901, the uses for the product had significantly expanded. 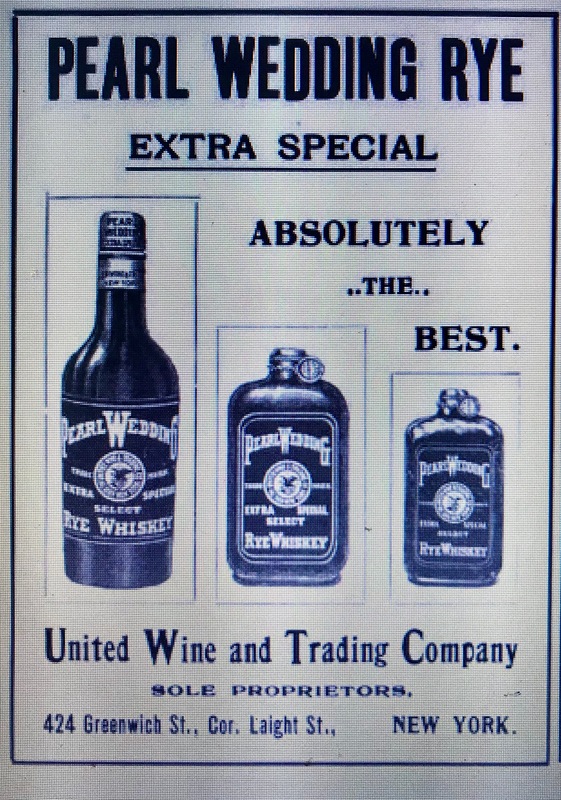 A June 5, 1901 advertisement in the “Boston Post” provided this expanded description. “3 In One” is the ideal lubricant for all delicate mechanisms. It will not gum, collect dust, turn rancid or dry out. For oiling bicycles, firearms, typewriters, sewing machines, hinges, locks, in fact, delicate mechanisms of any sort, it is better than any other preparation. It prevents rust and tarnish on metal surfaces in any climate, in any kind of weather. While Cole may have been the actual inventor of the product, it was Slee as a businessman who made it a national brand. According to an article he wrote in 1912 for a publication called “Judicious Advertising”the company did not employ traveling salesmen, but relied totally on advertising to develop the business. In an effort to create a demand among consumers he talked about two main methods: The first was advertising in publications of general circulation. Our general publication advertising embraces some seventy or eighty papers, all of which have been selected for specific and definite reasons. For instance, we use every paper in the United States and Canada devoted to the interests of sportsmen and the outdoor life. We call them “gun papers.” Then we use all the leading women’s publications. We use the principal boys’ publications. We are great believers in educating the youth. In other words, our advertising is based largely on class publications because we find by taking up a certain field and working it thoroughly we get better results. We prepare our ads to specifically interest the readers of each class of publication in exactly the thing for which he buys the publication. 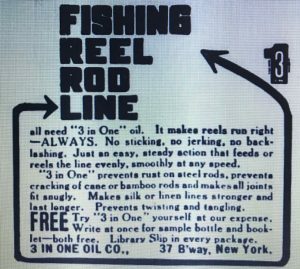 Certainly either of these two 1908 advertisements could have been found in any number of “Field & Stream” type publications. 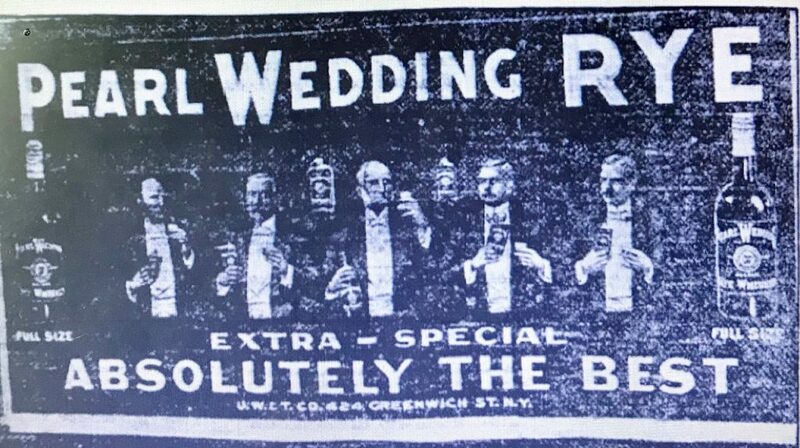 Likewise, in 1908, this advertisement would appeal to the reader of a women’s magazine. Another method he discussed was the distribution of samples and advertising matter by mail. Most of the earlier “3 in 1” advertisements included an offer for a free sample but he also spoke of another sampling method that put millions of samples in the hands of possible users right at the time they needed it. We have arrangements with certain leading manufacturers in many various lines whereby they pack a sample bottle of 3-in-One oil with practically every good gun or revolver that is sold. The Columbia Phonograph Company places a sample of 3-in-One with every machine they make. One approach that he didn’t mention in the article but caught my eye was providing a free oil can with your 3-In-One purchase. It’s a strategy that’s used quite often today at sports stadiums around the country when your beer comes in a free souvenir cup that’s yours to keep. 3-In-One Oil is still made today by the WD-40 Company and the trademark hasn’t changed much over the years. I found a total of three bottles associated with Three-In-One Oil and possibly a fourth. One is 5 1/2 inches tall. There’s no embossing on the front or back panels but both side panels are embossed. One side contains the company name, G.W. Cole Co., the other contains the words “Three In One” in quotation marks. 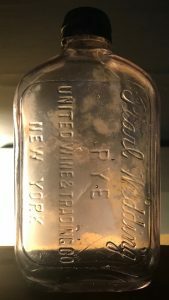 Mouth blown, this bottle dates between 1899 when the company incorporated and dropped the “&” in its name and 1909 when they were renamed the Three-In-One Oil Co.
Two others I found are also mouth blown, but only 4 inches tall. 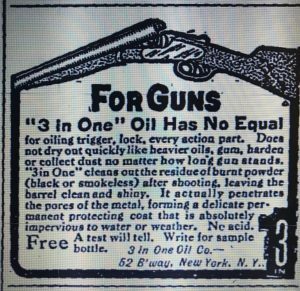 One side panel is embossed “Three In One” in quotation marks and the other 3-In-One Oil Co. 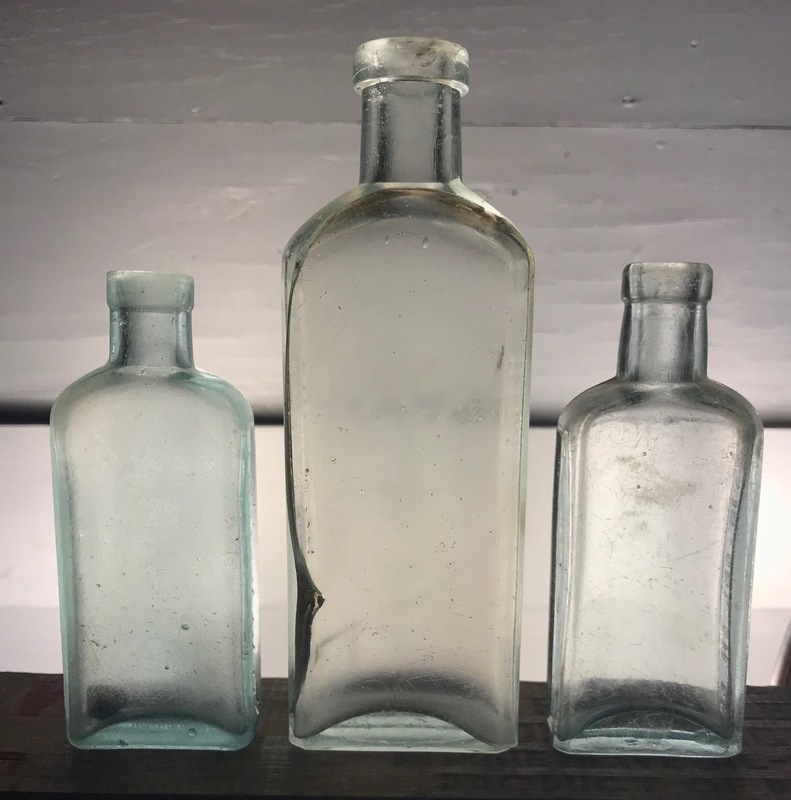 They date no earlier than 1909 when the company changed it’s name to the Three-In-One Oil Co. I’ve seen this same type of bottle, with a cork top, pictured in advertisements that date as late as 1929, but being mouth blown they probably were made no later than the mid-teens. The possible fourth is an ounce or less and could be one of their free samples. 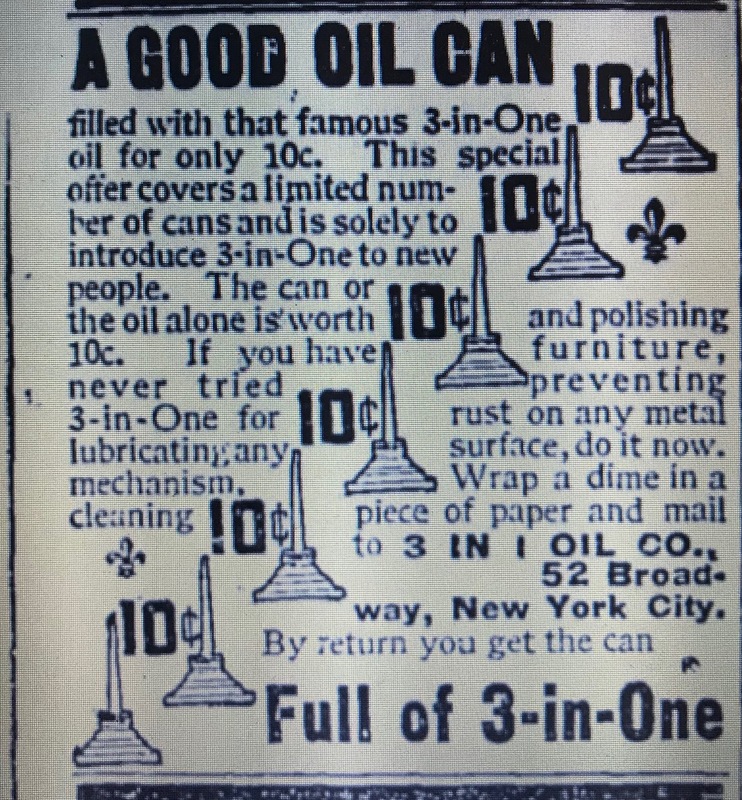 Its similar to the one contained in the advertisement below and would have contained the patented label floating inside the oil. 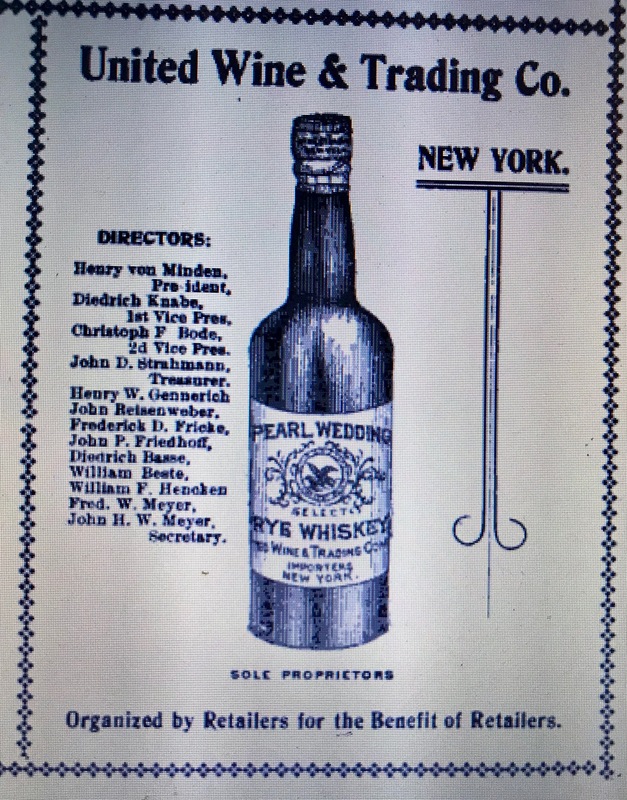 Author baybottlPosted on December 5, 2017 March 4, 2019 Categories Household ItemsTags antique flask, Asbury Park NJ, BIM, George W Cole, J Noah H Slee, Rahway NJ, Three-In-One Oil Co.
Bernard Kommel was first listed in the 1892 NYC Directory with the occupation of liquors located at 24 Allen Street and by 1894 he moved to Park Row. He added the Amsterdam Avenue location around 1897 and the 10th Avenue location a year later. The New York State Department of Excise listed Kommel as a certificate holder at these three locations in 1898. 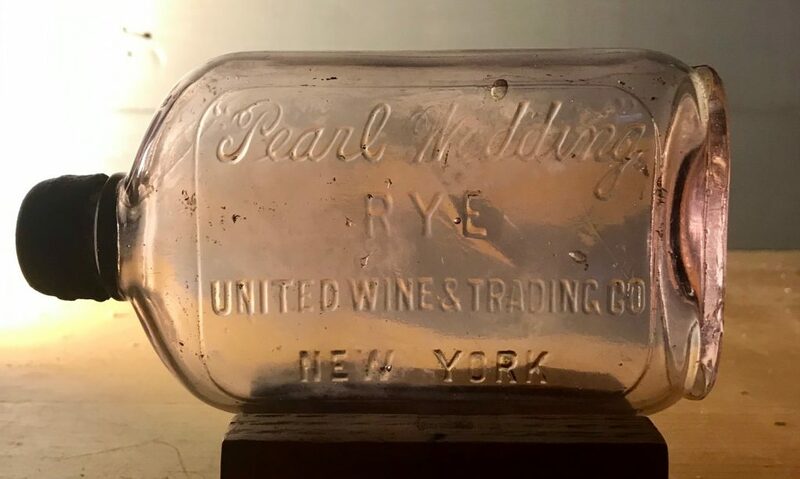 By 1900 the Amsterdam Avenue location was no longer listed, so 1898 and possibly 1899 are the only two years he operated at the three locations embossed on the bottle. The Park Row establishment was called the Billy Goat Saloon of which Kommel was the proprietor. According to a July 27, 1896 story in the New York World the place was not always on the same page with the law. Policemen Armstrong and Hahn arrested Bernard Kommel, proprietor of the “Billy Goat” saloon at No. 143 Park Row, yesterday for violating the excise law. Two hours later the policemen found 50 men in the place. Then they arrested Kommel’s wife. 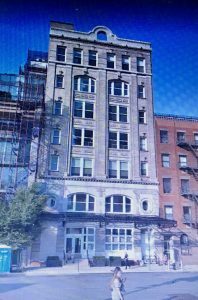 By 1905, the business had grown and he listed six locations in the directory: three on 10th Avenue, two on 11th Avenue and one on W 39th Street. The Park Row business was no longer listed. Kommel passed away sometime before 1909. The 1909 Directory listed his wife Bertha as a widow and there was no mention of any business locations. Kommel must have been some character. According to various newspaper accounts, he actually kept pet goats at the tavern and more than once they managed to make the newspapers. A December 11, 1895 story that was picked up by more than one newspaper, including the St.Paul Globe and the Quad City Times talked of one goat’s escape from the bar. NEW YORK, Dec. 11 – A goat was arrested for disturbing the peace in Broadway near Fulton Street by Policeman Franklin and locked up in the Church Street Station. The owner visited the station later and secured the release of the animal. Barney Kommel, the goat’s owner, keeps what is called the “Billy Goat” saloon at No. 141 Park Row. He told the police sergeant that the animal yesterday afternoon got drunk on hot Scotch whiskies to which he was treated by a man from Philadelphia who had been “doing” the Bowery. A day later a story on the front page of the Allentown Leader clarified the story. From the New York Evening World. The owner of the Nanny goat which was arrested for disturbing the peace in Broadway near Fulton Street, by Policeman Franklin yesterday afternoon and locked up in the Church Street station house this morning secured the release of the animal. Sergt. Saul said that he believed that he had full power to discharge the goat without sending it to a police court. Barney Kommel, the goats owner, keeps what is called the “Billy Goat” saloon on Park Row. He told the police sergeant that he had two goats. Yesterday afternoon “Nanny” got drunk on hot Scotch whiskey, to which she was treated by a man from Philadelphia who had been “doing” the Bowery. Mrs. Murphy, a friend and neighbor of the saloonkeeper was in front of the saloon when Nanny was brought home from the station-house. “Sure and why should the darlin’ be ashamed? Isn’t it a good woman’s failing’ just as well as a man’s to take a drop too much now and then?” said Mrs. Murphy. No one contradicted the lady, and she gave the bartender a nickel to straighten out Nanny’s nerves. Another story, from the same time period and also involving a loose goat, tells of the bar getting a new goat. When “Irish Dan” Barney Kommel’s pet billygoat, and the pride of the Park Row panhandlers, passed away happily, owing to his inordinate fondness for beer in his master’s saloon in Park Row last October, the whole neighborhood went into mourning. Dan was as fine a gentlemen goat as ever butted a hobo or sunk his nose into a foaming schooner. Without a goat the barroom seemed bare so Kommel imported a kid of tender years from the Brownsville district of Brooklyn to become Dan’s successor. The free lunch and the Park Row wassail was too much for the kid so it too left this vale of tears carrying along all the beer there was left. Then Kommel started out to hustle for a new goat. The new goat arrived yesterday and all day the arrival duly was celebrated at Kommel’s bar. The new goat was said to have been imported from Ireland, but there are vague rumors that it was captured in the Long Island woods. The billy was hitched to the bock beer sign in front of the place and announcement was made over the bar that he would be christened in the evening and that the festivities would begin at 8 o’clock. Billy was christened in proper style last night. Decorated with two funeral wreaths, a bunch of immortellies brought from a Bowery undertaking shop and a daisy chain he occupied the center of the barroom floor, shaking his head and bleating at all who came to pay him homage. All the thisty rounders in Park Row and the Bowery were at the celebration and once more there is joy and happiness in Kommel’s barroom. The Park Row addresses no longer exist. They were located on the grounds of what is now a large apartment complex. The bottle is a mouth blown strap sided flask. Embossed with the three specific addresses, it dates to 1888 or 1889.